Can you handle the ultimate teardown? Regulate 3,000 psi Down To 1 psi With A Miniature Regulator Weighing Only 76 grams! Beswick pressure regulators are miniature in size but big on performance. Save space and weight in your design. An elegant solution if your product is portable. Our award winning and patented designs are ideal for use in instruments, medical equipment, and fuel cells. Each regulator is 100% tested for quality. Available in a wide range of configurations such as: piston, diaphragm, single-stage and multi-stage, high flow, high pressure and manifold mount. Click here for pressure regulator product information. Click here for "The Basics of Pressure Regulator" article. In a new twist on "going with your gut," engineers at the U.S. Army Research Laboratory have developed a lightweight haptic technology belt that provides hands-free navigation for Soldiers in the field. The belt sends vibratory or tactile cues, allowing a Soldier to navigate to map coordinates and receive communications while still carrying a weapon. Just go right if it feels right. MIT researchers have developed a new alternative anti-counterfeiting technology that may be hard to beat. Some 2 to 5 percent of all international trade involves counterfeit goods, according to a 2013 United Nations report. These illicit products -- which include electronics, automotive and aircraft parts, pharmaceuticals, and food -- can pose safety risks and cost governments and private companies hundreds of billions of dollars annually. The Swiss excavator manufacturer Menzi Muck unveiled the first model in its new walking excavator series last year at the bauma 2013 trade fair. The working hydraulics in these highly specialized construction machines are configured as a complete system of Linde Hydraulics components, including the electronic control unit. 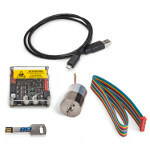 To help customers get started with Voice Coil Actuators (VCA) and the sometimes confusing electronics needed for building a system, BEI Kimco Magnetics has introduced the VCA Developer's Kit -- the first of its kind in the market. The completely self-contained kit includes a VCA with a built-in feedback sensor and a programmable controller with MotionLab Software that runs on the user's local PC. The included how-to kit answers all the questions needed to get a VCA system up and running, including where to source components, how to put components together, and how to program the parts to perform the motions needed. Can you handle the ultimate product teardown? Design for Manufacture and Assembly (DFMA) from Boothroyd Dewhurst is an intense teardown tool that focuses on benchmarking, Lean, and Total Cost of Ownership (TCO) methodologies to redesign products with reduced part counts and simplified assembly. Read about how oil and gas equipment producer Viatran used this intense process and software to redesign a hammer-union pressure transmitter with radical results -- and ask yourself if your products are ready for this kind of heavy-duty scrutiny. The new LED Information Base from Osram Opto Semiconductors is an online tool for selecting LEDs for applications in the automotive, industrial, consumer, and general illumination sectors. Users can quickly and easily find suitable components and obtain the specifications in digital format that they need for their design projects. This new online tool puts an end to checking and copying down values from LED data sheets. 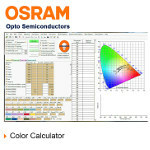 The online portal includes Osram's complete portfolio of LEDs in the visible wavelength range. 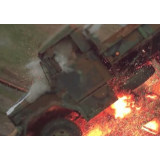 VCC has developed a re-lampable neon front-panel indicator light designed for harsh environments. The versatile 513x-038 Series midget flange base re-lampable indicators meet MIL-L-3661 specifications and are rated to NEMA-4 protection. Capable of accepting any T-1 3/4 midget flange base lamp, these high-quality indicators provide reliable status indication in a vast array of commercial and military applications. 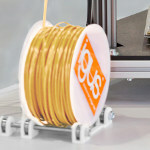 Motion system designers have a new option to arrest electrical current. 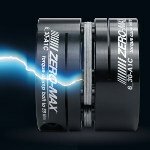 In addition to their primary function, Zero-Max CD couplings are designed with composite flex elements that are non-conductive. The flex element designed into Zero-Max CD couplings provides electrical insulation while protecting mechanical components from system overloads. CD Couplings do not pass electrical current through the coupling. In addition to protecting from stray electrical current, CD couplings protect generators in a system from transferring lower reaction loads to the generator bearings. They are available in many models and sizes, including custom designs for unusually large and challenging applications such as wind turbines. New Scale Technologies has added absolute encoding to its M3-LS Linear Smart Stage, a USB micro stage with fully integrated drive electronics and the industry's smallest all-in-one positioning stage. Absolute encoding eliminates the need to "home" the stage on power-up. It is a significant improvement over stepper motor-driven stages, which must be homed to locate the zero reference position every time power is cycled, and during operation can lose count of steps moved. 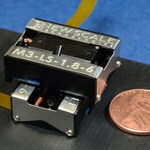 The M3-LS Smart Stage is driven by a self-locking SQUIGGLE piezo motor and holds position when power is turned off. When restarted, its absolute encoding allows it to move directly and immediately to the commanded position with 0.5 µm resolution. New, low-cost chips for sensing thermal energy could lead to a raft of new night-vision products, engineers say, ushering in everything from smarter cars to handheld devices for spelunking. A new technology used by Raytheon, called "wafer-level packaging," dramatically reduces the cost of making these thermal sensors. UK scientists from BAE Systems and Queen Mary University (London) have seemingly defied the laws of physics by creating a novel composite material that has been used to manufacture a new type of antenna lens. A Michigan company called FlexSys demonstrated its FlexFoil seamless morphing-wing control technology at the AIAA convention in Washington, DC, earlier this year. The creation of a variable-geometry airfoil has been a long-sought target chased by the defense and commercial aviation industries and researchers for several decades. SolidWorks 3D CAD gives you the tools to create and edit welded structures with ease. 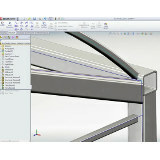 With SolidWorks Weldments, using multiple bodies in a part file enables you to simplify the structure of your designs. This video demonstrates: section profiles, trimming, instant 3D, and much more. See SolidWorks Weldments in action.